Looking for wholesome, nourishing holiday dishes to serve both smiles and health to your loved ones? I and a few of my favorite bloggers are teaming up to share our favorite Whole Foods for the Holidays. Starting today with soups, we'll take turns hosting a real food progressive dinner. Here's more information about the real food progressive dinner, including the schedule. To participate, make a soup post on your blog. (You can use an older post, too.) Make sure your soup post includes a link to this post. Then add your post to the Linky Tools box (below). Thumbnails come automatically from your blog post, or you can upload a special one. Leave a comment on this post and then visit the other posts that are linked up. The linky will be open into December, so feel free to come back later and add soups, too. Thanks, all! Don't have a blog? Share a nourishing soup recipe in the comments! Feel free to use either of these images in your soup post. Right-click (or command-click on Mac) and save to your computer. Then upload to your blog as usual. If you're looking for the codes to use the buttons in your sidebar, go here. This is such a wonderful idea! Keeping healthy during the holidays can be such a challenge. I’m glad to not go it alone and thankful for the resource this progressive dinner link-up will be. Thanks for hosting this! I missed the beginning of this progressive dinner, but I love the idea! I shared a mushroom soup recipe (still no picture!) that I shared last week. It was so simple to make. I’ve been eating it for lunch with a slice of bread – perfect! Barb — This is the beginning. You’re right on time! I don’t have a link to add today, but last night I made a variation on a Portuguese kale and potato soup. It’s a standard in my house, my husband loves it when I make it with a spicy venison sausage and red pepper flakes. I browned about a pound of local chicken sausage (can use any kind of sausage, I’ve used venison before) and removed it from the pot. Then I put two whole potatoes diced into the pot, one onion (chopped), two cloves of garlic (minced), three pieces of bacon (chopped) a quart of chicken stock, a quart of water and let them cook for about a half hour until the potatoes were tender. In a separate pot, I had soaked for 24+ hours 2 cups of white beans with a tablespoon of whey and a tablespoon of apple cider vinegar. I rinsed the soaked beans and cooked them in twice as much water for an hour and a half until they were tender. I added them to the pot once the potatoes were done. Then I ribbed and sliced up a bunch of kale and dumped it in the pot and stirred it in. Salt and pepper to taste. If I would have had any cream, I would have poured about a cup of cream into the soup just before I served. Yum, yum, yum! I love kale, and have only two family-friendly recipes for it. I’m going to try this one. I love the idea of a progressive, healthy dinner! Thanks for getting it started Wardee, and I’ll look forward to following its progress! 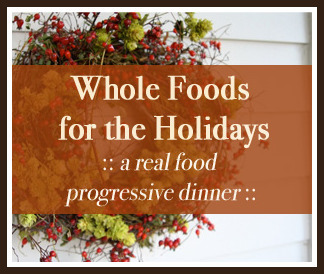 I love the idea of a real food progressive dinner! So excited to get some good ideas for the holidays! What a great idea! I haven’t been to a progressive dinner since my sister was in high school! Fun stuff! My soup contribution is a squash soup using the gigantic, bumpy, weird-looking Blue Hubbard Squash now in season. It’s bacony, gingery, appley and just hollers “AUTUMN” to me! In Keeping with our oncoming Summer it’s a cold soup…. Combine all ingredients (except yoghurt) in a large saucepan. Bring to the boil, reduce heat and simmer 1 hr until all fruit is tender. Rub fruit through a fine sieve or place in a blender. Just curious, how do you all serve your soup at a big meal like Thanksgiving? With all of the other food? As an appetizer? I am hosting for the first time this year and we will all fit around the same table, so I am thinking through how to actually serve food. I love this idea!! Although not exactly a holiday soup, but we love pea soup and lentil soup. They are so basic and easy to make with the crockpot and we eat them a lot in the winter. We also love the Asparagus soup in NT..Yum!